Will Gray's Travelers report on Jason Day's views of the U.S. Open and Phil Mickelson's 13th green meltdown. And from Dylan Dethier's Golf.com item on Jordan Spieth's Travelers Championship press conference where the defending champ commented on Mickelson's antics. "I laughed, I thought it was really funny," he said. In the aftermath of the incident, much was made about Mickelson's intent, but count Spieth among those who believes Mickelson's explanation that there was a strategic element to the decision. "Phil knows the rules," he said. "There was a chance it was going to go back behind the bunker and he's got to chip back, or he was going to play off the green anyways, so he was potentially saving himself a shot. So if that was the intent, then what's the harm in that? He's playing the best score he can." Fascinating to admire someone for using a technicality to get out of taking personal responsibility for a really bad putt. But this is where we are in the game. 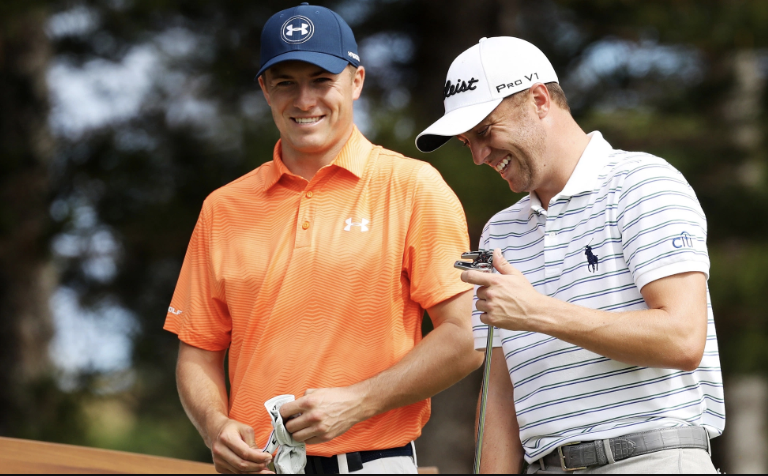 Spieth, Thomas Just Now Learning Of New 2-Hole U.S. Open Playoff!? Announced in February, the lads revealed that Tuesday at the U.S. Open was the first time they learned of the new system. My Golfweek item here. No big deal since it's not like they found out Sunday as they were about to go home to rest up for a Monday 18-hole round. But given their attention to detail, it does speak to a certain level of focus and insular protection from the golf news world that is...fascinating. Layered. Brentley Romine of Golfweek reports that the PGA Tour's advocacy of fans documenting every moment may be wearing on some players, with Jordan Spieth openly pleading with fans off the 8th green to just watch. But how are they to live under par, young Jedi? It's not just a way to play, it's a way to be annoying. Or it's thinking hard and playing young. Or...oh some slogan that cost too much and which needs to quickly end up on the trash heap of ad campaigns. ShackHouse listeners know we've been looking for signs from Jordan Spieth to be rounding into Masters shape, and at least according to Jordan Spieth, the sign arrived Friday. It's always refreshing to hear of the ways Augusta National Golf Club resists change for the sake of change. Particularly when the innovation in question slows down play and possibly strips the sport of artistry. As Jordan Spieth and Rory McIlroy revealed this week, their use of the intricate green reading books can be dangerous to their games. The lads don't have to worry about that dilemma at The Masters, however, since the club does not provide the books widely used on the PGA Tour each week. I explain in this Golfweek.com item with quotes. This is all worth noting for those who question how the club could force today's players to play by their rules on the equipment front. They can and could and probably will someday if no one else will act. And the players will still show up. It's been a few years since we've had some big movement in the player agent world, particularly as players either set up their own shop or move to boutique operations. Will Jay Danzi's departure from Lagardère Sports USA--with prized client Jordan Spieth joining him--lead to more switches or wholesale changes in how player careers are handled? The Forecaddie with some of the details of Danzi's move. When you're campaigning to chair the PGA Tour's Player Advisory Council to table slow play discussions started twenty years ago, declare caddie parking in Memphis a crisis and send Jay Monahan's calls to voice mail, you go negative. At least that's the risk Billy Hurley is thinking in his campaign for more chairmanship votes than Jordan Spieth. No matter what side of the aisle you sit on, concede that Hurley's gone to the best ad makers in the business. It's way too early for this to be a thing, but Jordan Spieth's early season struggle on the greens in Scottsdale and now at Spyglass is worth watching. Of note, Spieth's struggling on short putts, which, if nothing else should reassure you that even the best putter on the planet can struggle with the flatstick. Then there was Jordan Spieth, a week removed from missing the cut at the Phoenix Open, who opened in even-par 72 on Spyglass as his putting struggles continued. Spieth, who said Wednesday that he was in a “minor slump” on the greens, needed 32 putts to get through his first round. He did miss just three fairways and four greens while only carding one bogey, but he also holed just one birdie putt. He is tied for 98th going into Friday’s second round at Monterey Peninsula. When you break down the career Grand Slam winners and the many legends who have won three of four legs, the opportunity facing Jordan Spieth becomes impressive. Mention that he can do this at a younger age than Woods and Nicklaus and it becomes, as Jim Nantz noted in the piece I wrote for Golfweek, one of the great accomplishments in the history of the game. Jaime Diaz assesses where this feat would fall in the game's history and notes that Grand Slam is not a perfect measure of greatness. Walter Hagen, who won 11 major championships, didn’t have a real shot at what evolved into the Grand Slam because the Masters wasn’t even played until he was well past his prime. And what of Bobby Jones’ “original” Grand Slam in 1930, winning the U.S. Open and Amateur and their British counterparts in one year, which has never been replicated by any golfer over an entire career? That feat, or the still unattained the calendar professional Grand Slam, or even the Tiger Slam of 2000-’01, would all have to be more exalted than the career Grand Slam. Ryan Lavner reminds us that Tiger Woods, the last in the modern era to achieve the feat, didn't have much time to ponder the possibilties but pulled off the slam in his first try. Not only was Woods, at 24, the youngest to win the career Grand Slam, but he was the fastest, too – needing only 93 starts, compared with Nicklaus’ 125. Besides Woods, the only other players to complete the career Grand Slam in their first attempts were Gene Sarazen (age 33) and Ben Hogan (40). As always take these numbers with a grain or two, but at least we see where golfers are lining up with the highest paid athletes. Rory McIlroy landed T6th on the Forbes list at $50 million, tied with Andrew Luck and ahead of Steph Curry. The year comes on the heels of winning the FedExCup and finishing fifth in the Race To Dubai. His $16 million in on course earnings accounts for his 2016 PGA Tour play, FedExCup and European Tour play in the June 2016 to June 2017 window used by Forbes. Phil Mickelson ranked 12th, with $43.5 million overall, of which $40 million was from off course endorsements. Tiger Woods at No. 17 is credited with $37.1 million of which $37 million was made off the course. And Jordan Spieth ranked 21st, making $34.5 million, with $29 million of that credited to endorsement income. Nick Menta at GolfChannel.com reporting from the Memorial where Jordan Spieth explained the differences between 2015 U.S. Open venue Chambers Bay (where he won) and 2017 host Erin Hills. I believe the flyovers highlight what Spieth speaks to, but this is a great distinction to keep in mind. The greens at Erin Hills are more exposed and require way more aerial play than Chambers Bay. Plus, by all accounts the course is lush and we won't see the extreme ground speed we saw in 2015. That should please players and those who prefer a traditional inland U.S. Open "test", but annoy links enthusiasts.